Have you decided how you will go BLUE for M.E. yet? ME Awareness Week will run from 6th to 12th May 2019. We’ve plans a plenty coming forward that include dress down days, bake sales, and crazy hair days. Order your T-Shirts via Head Office or from the website shop. See below for details. But if all that seems a bit more than you can manage, then why not simply wear one of our new Go BLUE for ME T-shirts instead? Perhaps you can post selfies of yourself wearing the T-shirt to social media for the week? We’ll have plenty of literature available soon to help you explain why we go BLUE – to help make this cruel disease more visible. 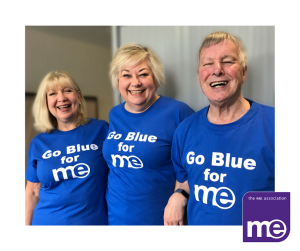 As you can see, our Head Office team are already getting into the spirit – pictured modelling our new BLUE T shirts are new staff members Helen Miller and Theresa Holmes with volunteer, John Cullen. The T shirts are exactly the same high quality ‘Fruits of the Loom’ cotton as our main T-shirt and are available in sizes from Small to XXL. The T shirts are available for just £8.00 each from Head Office (Telephone: 01280 818964 weekdays, between 9.30am and 3.00pm) or you can place an order and make payment via the website shop. We aim to post them to you within 24 hours of receiving payment. Had you considered also raising funds during ME Awareness Week? If you decide to hold a fundraising event or activity and raise funds for the ME Association, then you will receive one of these lovely T-shirts absolutely free! To sign up to fundraise, contact our fundraising manager, Helen Hyland, or sign up by visiting our new – Go Blue for ME – page on the JustGiving platform. ME Awareness Week (6th to 12th May 2019) is the most important part of our year. It’s when we all work our hardest to tell the world that M.E. is indeed both Real and Physical. And we don’t do it alone. We know that you, our amazing M.E. Community, will be using your precious spoons to come forward too, doing something, anything, to raise awareness of M.E. 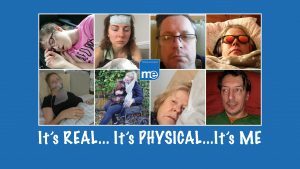 Read more about what the ME Association has planned for ME Awareness Week and discover ideas that will enable you to take part.